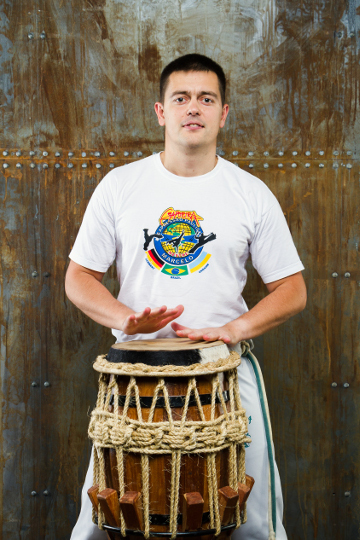 Our capoeira school is a part of world known Expressão Paulista de Capoeira group, founded by five-time Brazilian capoeira champion Marcelo Anderson Cândido (master Marcelo) in 1997. We train adults and kids using the program that includes not only the unique style created at our school but also classic styles so it lets our students get a well-rounded education in capoeira field. Marcelo Anderson Cândido started practicing capoeira when he turned 9 in Riberao Preto, São Paulo, Brazil. He made his first steps in capoeira with master Evklidesa (also known as a master Oripim), and later moved to the academy founded by his brother Jose Mario Candido (master Fumasa) and continued his studies under his guidance. Master Fumasa showed Marcelo an example on how to live with capoeira. Thanks to him capoeira became a life priority of master Marcelo. In 1992 Marcelo Cândido got a teacher degree (professor). In 1993 Marcelo Cândido became a member of Brazilian Confederation of Capoeira (CBC), he was actively promoting capoeira as an Olympic sport. After he joined CBC the success came quickly to Marcelo Cândido. 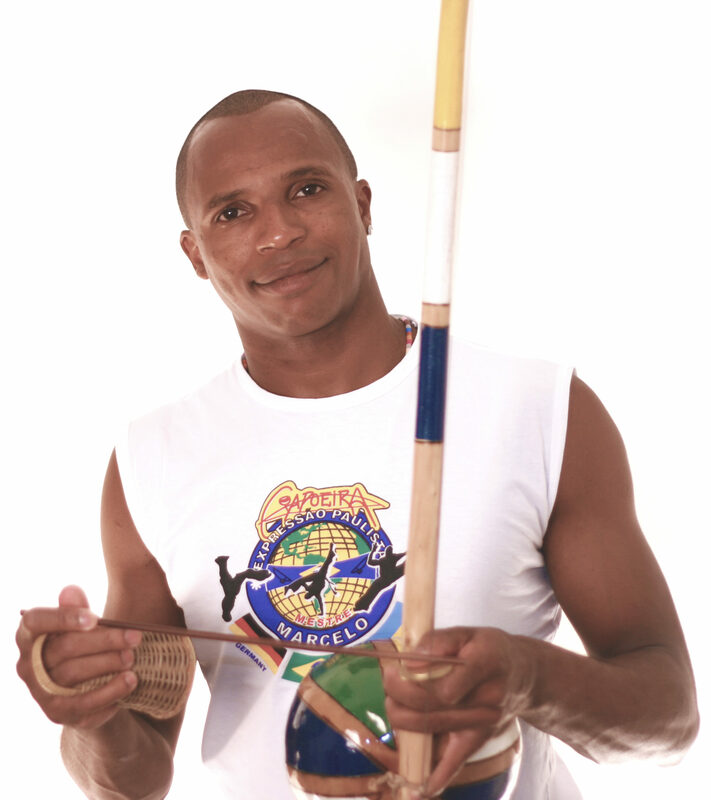 Being a member of Brazilian National Capoeira Team Marcelo became a five-time Brazilian capoeira champion (1995-2000). In 1996 Olympic Committee awarded Marcelo as the best athlete of the year. 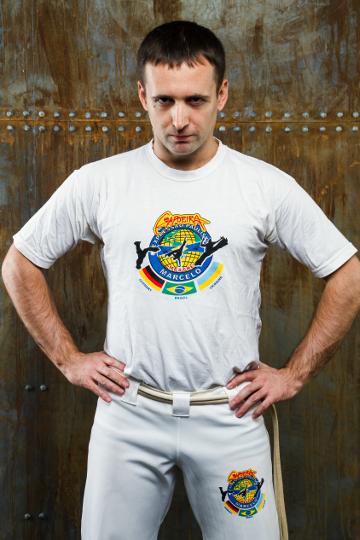 In 1997 his master and Brazilian Confederation of Capoeira recognized Marcelo Cândido as contra-master. In 2005 Marcelo Cândido became a master. Nowadays, master Marcelo lives and practices in Germany (Hamburg). He visits his branches in different countries and runs workshops for students. Took a part at 7 attestations at school, attended lots of workshops in Ukraine and abroad, trained with master Marcelo at his school in Hamburg, in 2015 spent 3 months living and practicing capoeira in Brazil. Uryi speaks Portuguese fluently so he can communicate directly with Brazilian masters. I’ve got a white-yellow belt (9th graduation, professor level). My motto is to unlock the potential of capoeira for the greatest possible number of people. Started practicing capoeira in 2001. In 2002 he participated at his first workshop with a Brazilian instructor, in 2004 attended a workshop hosted by contra-master Marcelo. Since then Sergey has attended many workshops in Ukraine and abroad by master Marcelo, Master Rui, master Balu, master Bamba, master Dende and master Bailarino. In 2006 he started coaching groups with different levels. In 2008 Sergey visited Brazil. This trip made a huge impression on him and let him understand deeper the essence of the culture and ethics of capoeira. In summer, 2017 he obtained the regular attestation and awarded the title of “professor” (white-yellow belt). Practicing capoeira since 2001. In 2004 he attended his first attestation at school with master Marcelo. In 2013 he got the 9th graduation belt (white-yellow). It corresponds to “professor” level at our school. 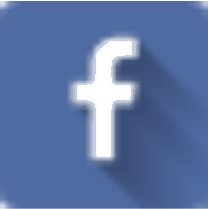 Volodymyr attended and hosted seminars and workshops in Ukraine, Dania, Germany and China. Volodymyr has been training groups with different levels since 2003. Andrey has been a part of Espressao Paulista group since 2006, he started training groups in 2009. He attended lots of seminars and workshops that were run by our school, actively participated at open rodas with masters and students from other schools. Capoeira gave me a new understanding of life as a battle, art, a game and philosophy. Your body turns into an instrument in your life. You need to listen to it, tune it up. My goal is to develop potential of each student while saving the core of capoeira. 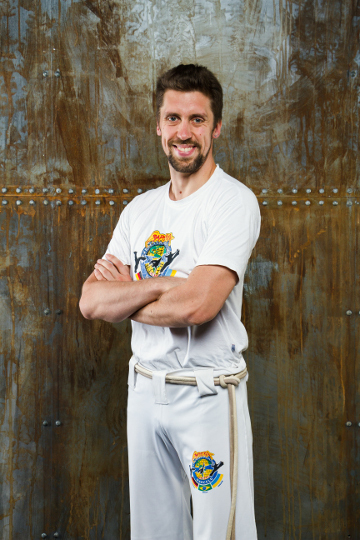 2013 – a participant of World Championship of Capoeira (Azerbaijan).